The injury-prone Boston Celtics open their series as four-point favourites over the talented but unpredictable Milwaukee Bucks (+4.0). Boston has been one of the best teams ATS this entire season going 50-30-2 while Milwaukee has struggled at 35-44-3. Straight up, Boston is 40-17 as favourites while Milwaukee is only 12-22 as underdogs. The four-point spread indicates that this will not only be a close game but a potential upset. The Celtics (-180) are without their two main point guards: superstar Kyrie Irving and sixth man Marcus Smart while Terry Rozier is playing through some injuries. The Bucks (+150) are as healthy as can be and feature all-around phenom Giannis Antetokounmpo on top of star guards Khris Middleton and Eric Bledsoe. On paper, the Bucks are the better team and they are statistically better as an offence with the seventh-rated squad (107.8). Based on talent alone, Milwaukee should be able to hang around and make this a game but Boston is just better coached, more experience, and play much better defence. 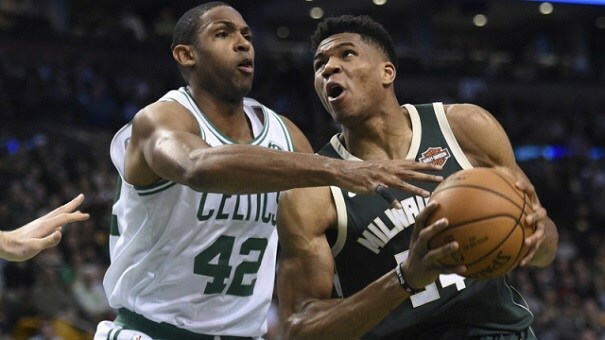 The Celtics' top-ranked defence (101.5), better rebounding (13th versus Milwaukee at 28th) will be the difference maker on top of their underrated frontcourt led by star centre Al Horford. The fourth-seeded Cleveland Cavaliers are -6.5 favourites against the fifth-seeded Indiana Pacers (+6.5) Despite being on two wins apart, the Cavs are strongly favoured to win thanks to LeBron James who has single-handedly dominated. They are horrendous on the spread however at 32-49-1 while Indiana is 47-35. As favourites, Cleveland (-350) is 39-25 SU while Indiana (+280) is 18-26 as underdogs. Thanks to a career-year from James, the Cavaliers practically have the same record (50-32) as last season despite missing Kyrie Irving. All he needs is for his supporting cast led by fellow star Kevin Love to play at a decent clip (while hitting their jumpers) and this should be a done deal. Too bad for Indiana who improved their season thanks to a revitalized Victor Oladipo. Since making the big trades, Cleveland is 19th in defensive rating but are still 29th overall (109.5). Their thin frontcourt also makes them so-so at rebounding (22nd) and interior defence (21st) but thankfully, the Pacers are not the team to expose these weaknesses. The Pacers are only an average defensive team (14th) and are 26th in rebounds. This will come down to which team can outscore the other and as two teams driven primarily by their superstars, you have to take James over Oladipo. No questions. The Cavs might be horrible ATS at home (13-27-1) but that won't matter here. 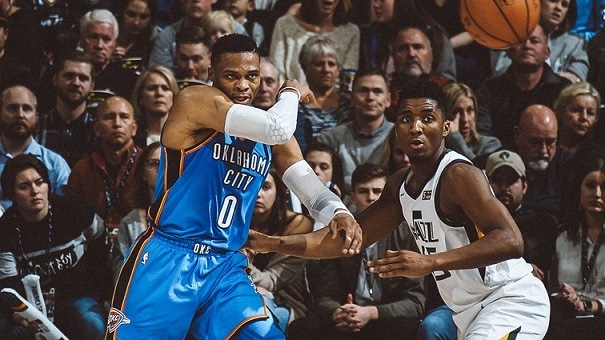 This intriguing four-versus-five seed duel pits the Oklahoma City Thunder (-3.5) against the Utah Jazz (+3.5). The small spread favours OKC who is terrible ATS at home 16-24-1 while the Jazz are road warriors at 22-19. As the favourite, OKC (-175) is 41-28 on the ML while Utah (+150) is 16-21 as underdogs. They have the same record (48-34) and are both talented teams who boast athleticism, explosive scorers, and solid overall team defence. The edge goes to the Thunder simply because of home court and owning Utah in their two games at the Chesaspeake Energy Arena. Russell Westbrook will once again play his ball-dominant (third-highest usage percentage in the NBA) style but he'll need to trust his teammates. In Paul George, the Thunder have a bonafide secondary superstar who can score and defend just as effectively as Westbrook. He'll be key in shutting down Utah's eclectic mix of swingmen who can score in bunches. Donovan Mitchell has been a revelation as the rookie is scoring 20.5 points per game but its their second-ranked defence (101.5) that has gotten the job done. Expect a grueling battle that may be a one-possession game but when it comes down to the wire, OKC's third-ranked rebounding team should get the key possessions. Provided Westbrook doesn't get too absorbed in "hero ball", this is the Thunder's game to lose. Don't expect any upsets here. The top-seeded Houston Rockets (-11.0) are the biggest faves for a reason. Ignore their 17-23-1 ATS home record because they are 4-0 ATS versus the Minnesota Timberwolves (+11.0) this season with all wins being by double digits. Minnesota is 47-35 overall but only 37-42-3 ATS and 10-21 as underdogs. This game, like the series, won't be close. Bet the farm on Houston (-905) who should run through Minnesota. The Rockets are the not only the second -ranked offence (112.2) but are sixth on defence (103.8). Minnesota has the fourth-rated offence (110.8) but only the 23rd-ranked defence (108.4). Outside the Cavs, the Wolves are the worst defensive team in the playoffs and they won't be able to keep up with Houston's scoring. MVP candidate James Harden and fellow superstar PG Chris Paul will be too much for Minnesota. Their best player is Jimmy Butler, who isn't 100% due to coming back from a knee injury. Karl-Anthony Towns is a superstar big man in the making but isn't wholly effective on defence. Houston will exploit the pick-and-roll and assault Minnesota relentlessly. If Minnesota catches on fire, they could stay in this game but they are also the worst three-point shooting team (8.02 three-points made per game) while the Rockets are the best almost doubling Minnesota with 15.32. This is a blowout.